Q: When is a pie not a pie? A: When it's a stew with a pastry hat on. Like Murray, the inimitable manager of Flight of the Conchords, I like pie. 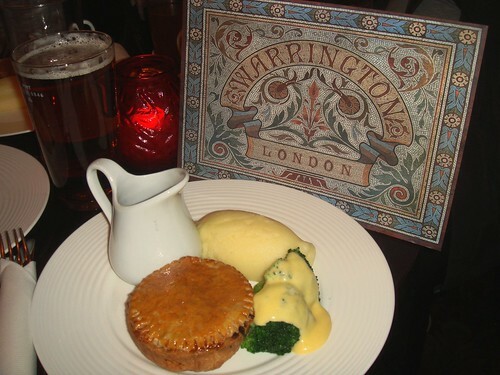 So when I was invited for a pie and a pint at the relaunch of The Warrington in Maida Vale (part of Gordon Ramsay's empire), I was hardly going to say no. But my standards are high and a bad pie won't fly *cough*, and I was a tad dubious thanks to previous intel that Gordo's gastropubs cooked their meals off-site for reheating just before serving (in fact Marina O'Loughlin mentioned this the very next morning). 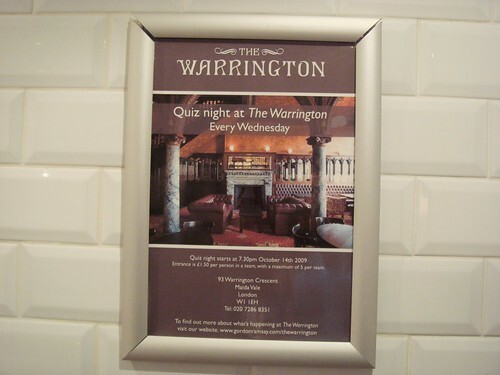 However, it's all change at The Warrington - with a new head chef, sous-chefs and general manager, they're determined to start with a clean slate. Apparently there's been a refurb - not that I'd know, as I'd never been before - but what I saw, I liked. With beautiful original features such as stained glass windows, marble pillars and wood carvings, it felt quite Dickensian, but in a good way, like the end of A Christmas Carol or the knees-up in Oliver! and is basically a proper boozer (they even have a quiz), where I'd be happy to sit all night, nursing a drink, with or without company. Offered a choice between minced beef with a potato topping (aka cottage pie) and traditional game pie, unsurprisingly we all plumped for the latter, though one of my colleagues at least made an attempt to act like he was in two minds about it. The charming waitress said it had "venison and various game birds" in it - good enough for me. We sat around a little table and waited for our pies whilst sipping our billed pints of beer and cider (everyone else) and iced ginger ale (me - I don't like beer - it tastes of bitter disappointment as far as I'm concerned). After a short wait, the food arrived. The pies seemed on the small side - like you could polish them off in three or four bites - but I was delighted to see they came fully enrobed in crisp shortcrust pastry. No more half-baked pastry-hatted stews here. And despite their bijou dimensions, it turned out they were densely packed with rich, delicious meat - so packed in fact that there was next to no juice, though the meat somehow remained moist. 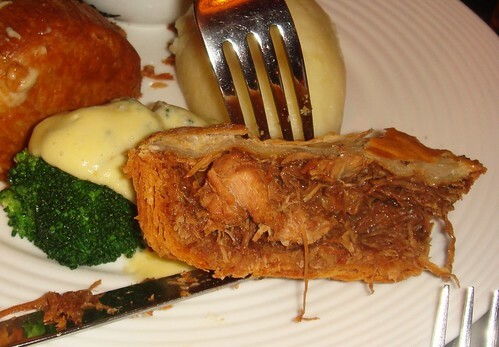 As for the pastry, it was flavoursome and perfectly short and crumbly, even when drowned in a pool of the luscious gravy which came in dinky pitchers on the side. Accompaniments were a mixed bag - sound, creamy, mashed potatoes, but a stingy-seeming brace of broccoli florets, rather bizarrely doused in over-sharp, claggy hollandaise sauce. Disregarding the broccoli, it was a fine meal which I'd quite happily scoff again and ridiculously good value at £10 for a pie and a pint. We were then asked if we'd be interested in sampling their desserts. Once again, a very slight attempt at coyness was made by the others, but I immediately said "Bring it on". 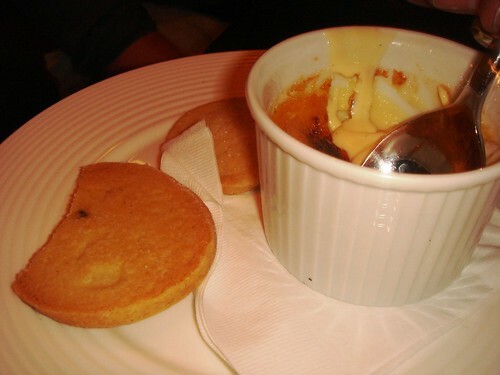 First up was honey and Drambuie creme brulee with shortbread. I'm used to lavender honey being employed to nauseatingly floral effect, but here the honeyed touch was just right and the flavours delicately boozey. Alas, said booze sadly mucked up the texture, which was more like a runny creme Anglaise than a set custard. The biscuits were deliciously light though, with good snap to them. Next was tarte Tatin, which again showed that the Warrington knows its pastry even though apparently there's no dedicated pastry chef. 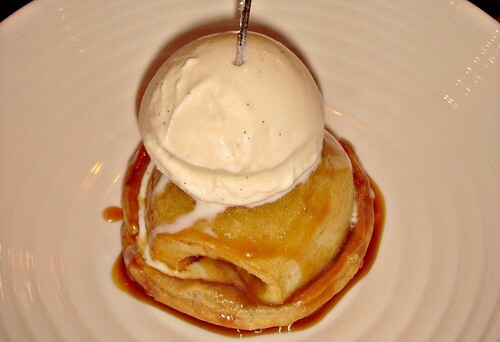 The crisp tart shell combined with sweet, caramelised apple and smooth vanilla ice cream was a sensation. 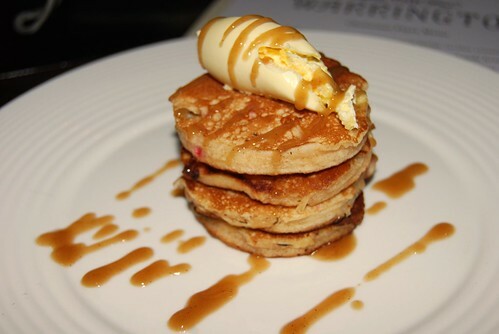 Lastly were Scotch pancakes with a toffee sauce and clotted cream. I find pancakes can be hit and miss, occasionally resembling rubber insoles, but these were moist and decidedly unstodgey with Christmas spices like cinnamon and nutmeg, and generous chunks of candied fruit mixed into the batter. These too were a hit. So the pies were great and the desserts worth leaving space for, so long as they get that damned creme brulee right. 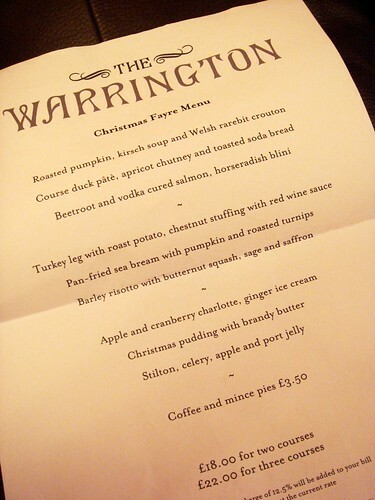 The Christmas Menu is also rather appealing, even if it does insist on using that ghastly word "fayre". I was especially tickled that they're serving (boned) turkey leg instead of dry and dreary breast. More to the point, it's only £22 for three courses - pretty darn cheap considering you're in a Ramsay joint. Talking of old Frozen Face, I asked the new chef Simon (I failed to elicit his surname) "what Gordon was really like", hoping to garner some juicy insider gossip. He blushed and said he had no idea, since he hadn't actually met the big man yet. 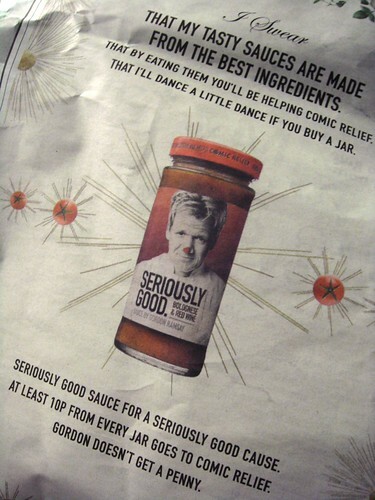 This confession left me crestfallen, as I'd rather been under the impression that Ramsay personally anointed each of his chefs in some kind of Masonic ceremony. However, I was soon cheered up when I spotted the absolutely stunning bar snacks menu. The new chef is a friendly, keen chap and told us that he wants to cook the things that he himself likes, rather than try to tailor for a particular audience. Well, all I can say is great minds think alike, since I wanted to take that snack menu home and caress it softly. 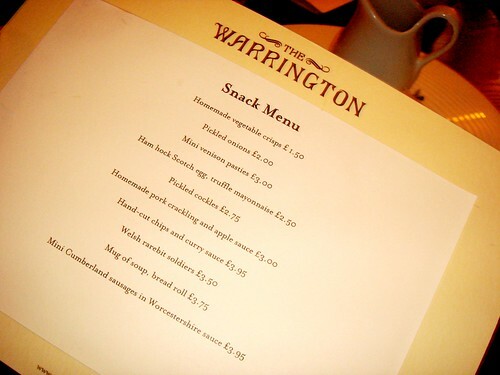 At any rate, I fully intend to come back to The Warrington and order two of everything, and four of the Scotch egg, especially as these days almost everything is made in-house - even the cockles are pickled on-site. Incidentally, a friend who lived in the room below me at college tended to leave his window open, and so I once left a bag of pickled cockles in his sink as a joke. Reader, he married me. Dead right on all counts - great pies but WAY too small. In the words of Hugh Laurie, I could have eaten two and still had room for a dolphin on toast. 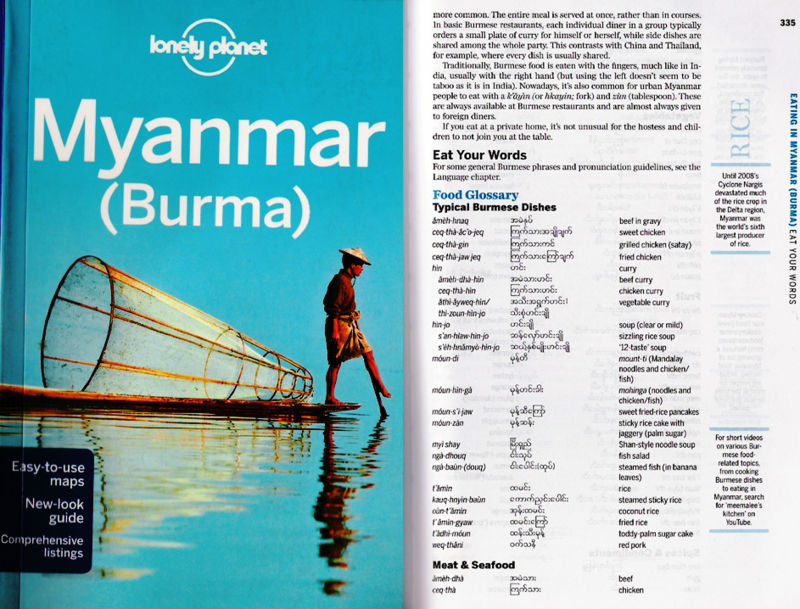 What a brilliant place - all it needs is no muzak? You know, the sort of stuff that goes with flocked wallpaper. 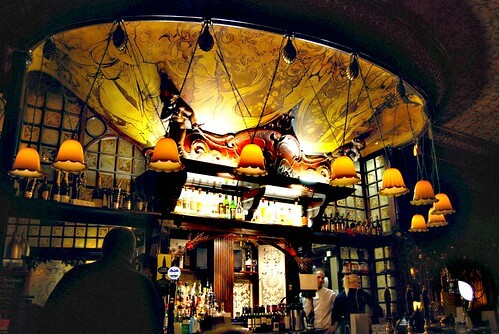 Great blogging as usual and wouldn't I like a pub like that within a mile or two of home. Sadly, the only place is one where the early evening sport is stare at the stranger while he tries to unstick his shoes from the carpet (the late evening sport is to beat the stranger up - and if there isn't one around, they turn on each other), sigh. Chumbles, I need your address - I don't know where to send your DVD! You write so well! 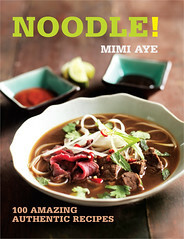 Giggles, a bit of healthy salivating and elegant prose - perfect! I was really disappointed that I couldn't make this. It would have been great to join in a chorus of "I love pie". Plus it's just around the corner from my nan's house, I might still take her there anyway. But c'mon MiMi, what's there not to love about beer? @Suzler - Hey Suzy - thank you, that's very kind. And I'm surprised that people think the cockle story is sweet - my husband thought I was a nutter. PS I don't understand livejournal, I may need to ask your advice on how it works. PPS I want to hear the cockles heart joke! @FoodUrchin - Take your nan now - it's cozy, beautiful and packed with happy regulars who've been there since the dawn of time. Sure! Do you want to know anything specific, or would you like a general overview? As for LJ - general overview. Whole thing scares me. I'll catch up with you when I'm back from ATP. 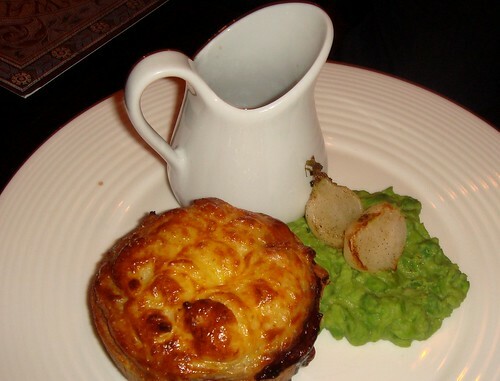 Ouch - I blogged a pie which clearly falls under your 'stew with a pastry lid' category. In all fairness though when I was 7 I ate so much (shortcrust pastried) pie I threw up in my sleep. Mmm. Puff is now my preferred. I liked the Pub, a proper Victorian Gin Palace.....and I liked the pies, although I have to agree too small and dainty, they needed to be at least half as big again. Overall, if I was in the area I'd visit again for sure....I think they struck the balance between 'boozer' and 'restaurant' well actually. Hollandaise with pie and broccoli? Eh?! @Helen - It was weird.